Will Hillary Clinton Win the Election? Subject: Will Hillary Clinton Win the Election? 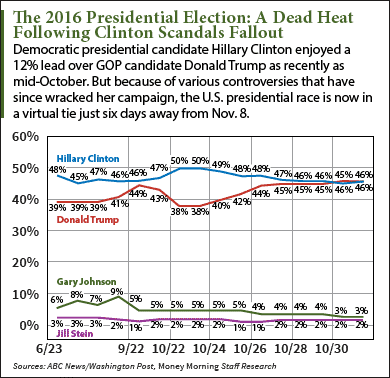 Another round of jaw-dropping scandals only days ahead of Nov. 8 has Americans wondering, "will Hillary Clinton win the election?" 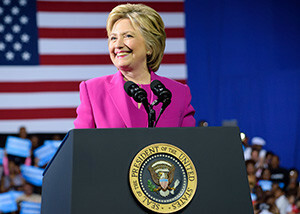 Can she, after an election season full of leaked emails, highly publicized investigations, and gaffes that has systematically taken a toll on the Democratic candidate's shot at the presidency? In fact, the polls show that Clinton and Trump are neck and neck in the race for the Oval Office just six days before the vote. For example, today's Real Clear Politics poll puts Clinton ahead of Trump by 1.7 points, based on average data pooled from sources such as FOX News, CNBC, ABC News Tracking, and Reuters. Meanwhile, the latest ABC News/Washington Post poll has Donald Trump at just under a one-point lead (0.07%) over Clinton. A landslide is simply not possible in this election because of the Electoral College, which in 2016 is closely split between Democratic and Republican votes. While it might not be a big win, Clinton can still count on the historical voting practices of 18 states, including the District of Columbia, which collectively have 242 votes. These states have voted Democrat in the past four election cycles. GOP presidential candidate Donald Trump can realistically count on 22 states that have voted Republican since 2000 — but collectively only have 180 votes. President Obama's knowledge of Clinton's private server well before his initial admittance. His original claim was that he became aware of the server "the same time everybody else learned it, through new reports"
But let's not forget about the most recent addition to Clinton's scandal rap sheet: FBI Director James Comey's announcement Friday that the bureau would reopen the investigation into Clinton's use of a private email server during her time as secretary of state. This is based upon discovery of new evidence that links back to disgraced former New York Congressman Anthony Weiner. The New York Times suggests that Clinton is favored to win even though a Trump presidency is clearly not off the table, writing on Nov. 2, "Mrs. Clinton's chance of losing is about the same as the probability that an NFL player misses a 35-yard field goal." Tell us about your prediction for the outcome of the 2016 presidential election on Twitter @moneymorning or Facebook.